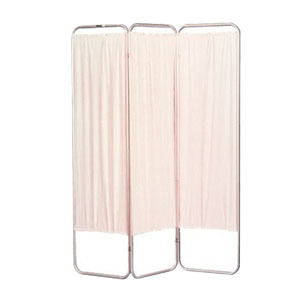 Non-magnetic Folding Privacy Screen features a frame of 3/4" dia. anodized aluminum with stainless steel hinges. Panels are 6 mil flame-retardant bacteriostatic white vinyl. Frame of 3/4" dia. anodized aluminum with stainless steel hinges. Panels are 6 mil flame-retardant.